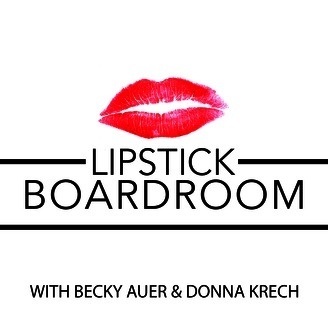 In The Lipstick Boardroom, you'll meet Becky Auer & Donna Krech, REAL entrepreneurs who are doing it all - at home, in business and making it all work. They’ve got actionable advice to share in four categories: Health, Balance, Business and Hot Topics! Becky and Donna share tips and secrets of how they're integrating their business and personal life with success - and their failures too! Grab a cup of coffee, learn some secrets, have some laughs and join us in the Lipstick Boardroom. If you're a business woman over 40 years old, you'll love it here. On today’s episode of Lipstick Boardroom, Becky and Donna reveal the #1 way to get stuff done, why water is SO important, the one ‘leg up’ you can give your child before they are even born, the BEST way to follow up with a prospect and How To Get Stuff Done Fast! LB 006: How Your Mind Can Help You Succeed, 3 More Ways to Shape Your Body Quickly, 5 Ways to Create Memories, It Takes 12 Touches to Reach a New Customer and How To Get Rid of Bra Flab! LB 005: 3 Ways to Shape Your Body, Tips to Utilize Your Time Better and How to Lift Your Breasts in Two Easy Steps!